I’ve always been fascinated with alpine ecology and treeline ecology, and in my readings on these subjects I discovered a fascinating paper in the journal Ecology by the brilliant Rockies ecologist John Marr entitled, “The Development and Movement of Tree Islands Near the Upper Limit of Tree Growth in the Southern Rocky Mountains” (1977). The paper absolutely captivated me because it encompassed my interests in the mountains, alpine zones, snow, climate, and conifers. 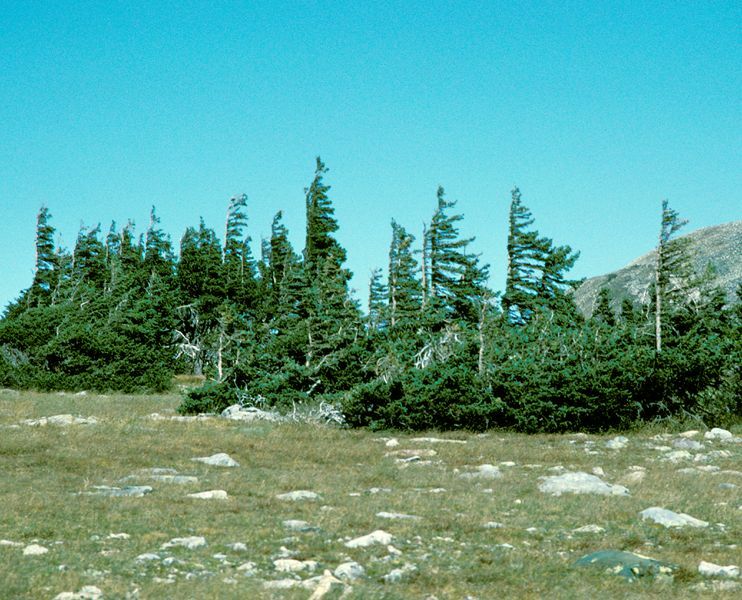 Tree islands are weather-driven patches of dwarfed, deformed timberline species adrift in the alpine community. A phenomenon unique to conifers employing adventitious root growth, they are triangular in shape, present a gentle windward face, and are steep to leeward. Islands are often up to five meters in length and one meter or more in height at leeward, and may start as detached segments of timberline or have their genesis from seeds germinating in acceptable microclimates. Niwot Ridge in the Rockies. 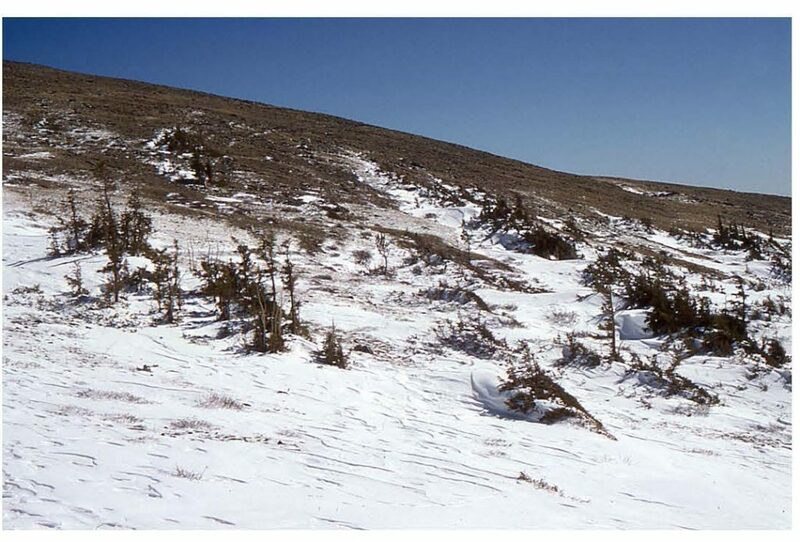 The prevailing wind determines shape and direction of travel (approximately 4cm/yr in the Rockies according to Marr) and leeward snow accumulation simultaneously eliminates downwind competitors and provides insulation and moisture to the forward aspect. 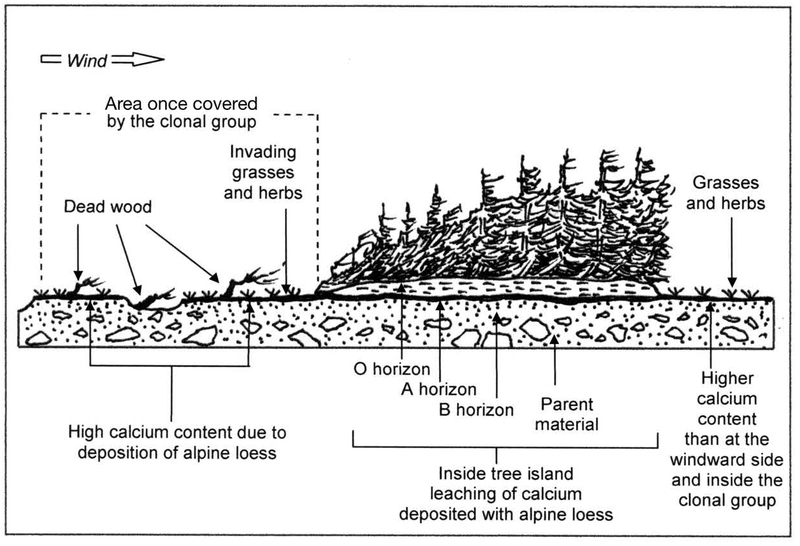 Growth takes place on the downwind side via adventitious rooting, made possible by the timberline low-growth habit and the accumulation of alpine loess in the eddy behind the island, and the upwind side is slowly killed by the erosive effects of the wind. Thus, a tree island moves across the landscape, encountering terrain-wind complexes that may elongate or shrink the island. Additionally, a recent paper by Holtmeier and Broll (2017) (see also their 1992 paper) demonstrated that the leeward reach of tree islands provide cooler and moister germination conditions during the growing season and warmer and wind-protected conditions during the dormant season, thus allowing for some new plant material to generate within the island. Marr first described tree islands after observing clusters of conifers growing in conditions unfavorable to the species and concluded that they were trees migrating through hostile terrain while running before the wind. How brilliant and remarkable is that observation and explanation! Benedict (1984) studied island movement and age via radiocarbon dating and estimated the point transition time of a 500-year-old Picea engelmannii island to be approximately 120 years by using dead wood remaining in former movement paths. Another observation gleaned from the papers is that in these landscapes, there is almost no regeneration of the tree island species (P. engelmannii and Abies lasiocarpa) beyond the tree islands. Thus, we see that tree islands induce ephemeral patterns of spatial and diversity change in the alpine community matrix in ways that may be seen as a long-term subprocess of the alpine community. Latest edit: 10 October 2018. Graphic attribution: Climate Research Vol. 73: 85– 96, 2017. https://www.int-res.com/articles/theme/c073p085.pdf.